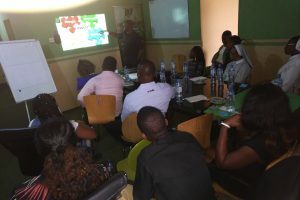 After a refreshing three-week Christmas break, SPACES FOR CHANGE’s | S4C’s Board and staff members kicked off the new year with a strategic planning session held on January 7, 2019 in Lagos. The session, facilitated by John Onyeukwu, a strategy planning expert from Creative Alliance International, aimed to improve organizational performance by assessing the progress recorded in the previous years and set the direction and priorities for the 2019 operational year and beyond. After two whole days of thinking and planning together, the result was a strategic work plan that would inform future decisions, provide an outline to guide resource allocation and pull everyone around the single plan. Has the organization delivered on its mandate? Have staff members sufficiently challenged themselves to execute projects that would yield high impact? The first session began with moments of self-introspection, which had both Board and staff members pondering the answers to these questions, looking back from 2012 up to 2018, outlining the high- and low-points of the organizational journey since inception. According to John Onyeukwu, there is a global shift—from regular charity towards innovative and idea-based enterprises—in the civil society sector. It is therefore imperative for civil society organisations like S4C to be flexible and prepared enough to adapt to this global shift. To effectively guide the development of the new plan and strategy, the facilitator raised a number of thought-provoking questions such as: ‘Where is S4C now?’, ‘Is this where S4C should be?’, ‘How would S4C get to where it should be?’, ‘Are there things that should be done differently to produce a different result?’, ‘What are the efficient ways to measure organizational progress?’, ‘Are there thematic programs S4C should consider dropping?’, and so forth. Staff members were split into two groups to discuss these questions in clusters, with all participants making very rich inputs, highlighting areas they resonated with and other things to consider. Afterwards, each group carried out a SWOT analysis which involved an appraisal of S4C’ strengths, weaknesses, opportunities and threats. The weaknesses were addressed and plans to mitigate the threats were set. The PESTEL model is a tool used to elaborately evaluate the external factors that may have a strong effect on organisational operations. Using this framework, Board and staff were able to assess the external factors in the political, economic, social, technological, environmental and legal contexts with enormous potential to influence or affect S4C’s line of work. Some important trends considered include the shrinking civic space, electoral violence, political instability, fuel subsidy reform, fake news, labour unrests, and rising inequalities in the country. The last session challenged participants to imagine a new future where all the identified institutional strengths are scaled up and the weaknesses and threats addressed. One thing was clear: this imagined future would not be realizable without having a coherent strategy for financial sustainability, developing alternative income streams, maximising opportunities through public- and private-sector partnerships, deepening analytical skills, enhancing internal communications, strengthening advocacy reach and access to stakeholders, building more partnerships within and across the borders, and sharing success stories through efficient use of the media. Wrapping up the session, S4C’s Executive Director, Victoria Ibezim-Ohaeri, expressed her commitment to work together with all staff to actualize the targets set during the session. She also thanked the Board member present, Dr. Anastasia Njoku, for her unflinching support and immense contributions to S4C’s institutional successes over the years. The session ended with clear understanding of roles, expectations, and strategies for bolstering individual productivity and collective performance during for the year and beyond. PreviousPrevious post:Homegrown-School Feeding Programme: Presenting Research Findings to Imo & Abia State AuthoritiesNextNext post:BADIA-EAST DEMOLISHED AGAIN! HUNDREDS ARRESTED AND THOUSANDS DISPLACED!